J. Aaron Hawkins Sr. Center was formerly known as Hawkins Center for Women. 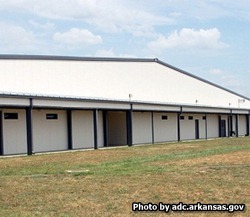 It now houses over 200 female, and 200 male inmates in Pulaski County Arkansas. It is one of the few facilities in Arkansas that houses female inmates. The custody levels of inmates incarcerated at this facility is medium. Hawkins has education programs for inmates, as well as substance abuse programs. Some of the other programs this facility offers are the pathway to freedom program and the event start family literacy program which focuses on the importance of reading. Parenting programs help many of the male and female inmates learn the importance of parenting. J. Aaron Hawkins unit also participates in the PAWS in prison program which allows inmates to work with animals. Rotating schedule on Saturdays and Sundays from 11:30am-3:30pm. You will need to contact the inmate to find out which day and time they are allowed to receive visits.